Near the Eastern France/Germany border, the region of Alsace is a unique mix of French and German culture. Over the region’s long and storied history, ownership of this region has passed back and forth between the two countries time and again, resulting in shared influences on the cuisine, language and culture of the area. The Chateau du Haut Koenigsbourg is perched on a mountain near the town of Orschwiller, and is a fascinating look into the region’s past. Originally built in the 12th century, the castle and grounds were intended as a fortress in a strategic location perfect for watching all the main roads in the area. Defensive structures were added when the castle was rebuilt after the original was destroyed in 1462. Unfortunately, the castle was again destroyed in 1633 and sat in ruins for two hundred years, until Germany took ownership of the region again and the town transferred the property to Kaiser Wilhelm II, who restored the castle to its former glory. Since 1908, when restoration was completed, the Chateau du Haut-Koenigsbourg has looked down over the Alsace plain, first as an estate of the Kaiser, then as a French national historic site. On the day we visited, the mountain was foggy, with snow in the air. We were practically the only visitors, and got to take in the unique perspective of the castle in winter. It was easy to imagine how isolated, and yet how cozy and secure this chateau would have been in the colder months of the year. As with any castle fortress, there is an exterior “village” area where the workers (blacksmiths, coopers, farriers, etc.) would have plied their trades, then an interior keep where the family would have had their living quarters. Drawbridges and heavy doors separate the interior living quarters from gardens, pens for animals and the like. A small chapel, an armory and a room full of hunting trophies are highlights of the grounds tour. At the conclusion of the grounds tour, there is a restaurant featuring delicious local fare, such as quiche Lorraine and blueberry tarts. In addition, a gift shop offers souvenirs related to the castle and general historical items. I picked up a medieval cookery/receipt book and some souvenirs for the kids. The Chateau du Haut-Koenigsbourg is convenient to other Alsatien towns. We stayed in Colmar, but Strasbourg is only about 50 minutes away if that’s your home base in Alsace. Our visit was in early November, which is a great time to visit and avoid the crowds if you don’t mind a little cold. The earliest known mention of the word “cocktail” dates from a 1798 issue of London’s The Morning Post and Gazetteer, however it wasn’t until 1862, with the publication of How to Mix Drinks: or The Bon Vivant’s Companion, by “Professor” Jerry Thomas, that recipes for cocktails were first published. The four basic ingredients of any cocktail – spirits, sugar, water and bitters – formed 10 cocktail recipes in Thomas’ book. The “whiskey cocktail” in the Companion contains 3-4 dashes of gum syrup, an old-fashioned type of simple syrup that adds gum arabic for a smoother texture, 2 do. Bogart’s bitters, 1 wine-glass of whiskey and a piece of lemon peel. Compare this simplest of cocktails with the classic Old Fashioned and you can see the similarity: whiskey, sugar or syrup, bitters and citrus. Add in a cherry and you have a delicious way to enjoy your favorite whiskey, whether bourbon or rye. My favorite version combines Bulleit Rye, Tippleman’s burnt sugar syrup and Jack Rudy bourbon cherries. From classic to modern, the Moscow Mule is a 20th-century creation seeing a resurgence in popularity. Created in the 1940’s when bartenders had an overabundance of vodka and ginger beer, this drink is refreshing enough to drink in summer, and warm and spicy enough to drink in winter, making it the perfect all-year cocktail. Smirnoff Vodka, the original brand used in the drink, and Q Ginger Beer combine with fresh lemon juice to create my perfect Moscow Mule. Another favorite cocktail I love to mix up is a fresh, delicious agave margarita. While the classic Mexican margarita contains orange liqueur, this agave variation nixes the orange liqueur in favor of fresh, crisp lime juice and sweet agave nectar. Use a good quality silver tequila, like El Jimador, and an organic agave nectar like Tres Agaves for a quick and easy, go-to drink. Whatever your favorite flavor, the world of classic cocktails offers plenty of interesting, delicious and sometimes little-known drinks for your to explore. Whether you check out a bar specializing in classic cocktails and variations, like The Dead Rabbit, or mix up your own drinks at home, these drinks are usually quick and easy to make and taste best if you start with high-quality spirits and other ingredients. Drink up! When life gives you overripe bananas and a snow day, you make Elvis cake! When the weather reports first called for snow, I honestly didn’t believe it. I mean, it’s nearly Spring and all. But snow it did and it’s still coming down. I woke up this morning to the news that school was closed, and since my husband is an essential employee at the state lab, I got to be the one to stay home. Snow day! We had breakfast, we watched some tv, we played, we colored. Then we got bored. I added recipes to my Paprika app (my absolute favorite cooking and recipe app EVER) and came across one for peanut butter and banana cake. I knew we had some overripe bananas in the fridge, so I figured I’d give it a go. The first step was to make the jam, or banana filling. Since I only had three bananas, I halved the original recipe and mushed them into a saucepan. Then I added the sugar, water, vanilla (I used liquid vanilla extract rather than a vanilla bean because that’s what I had on hand) and lemon juice, then turned the heat to high. 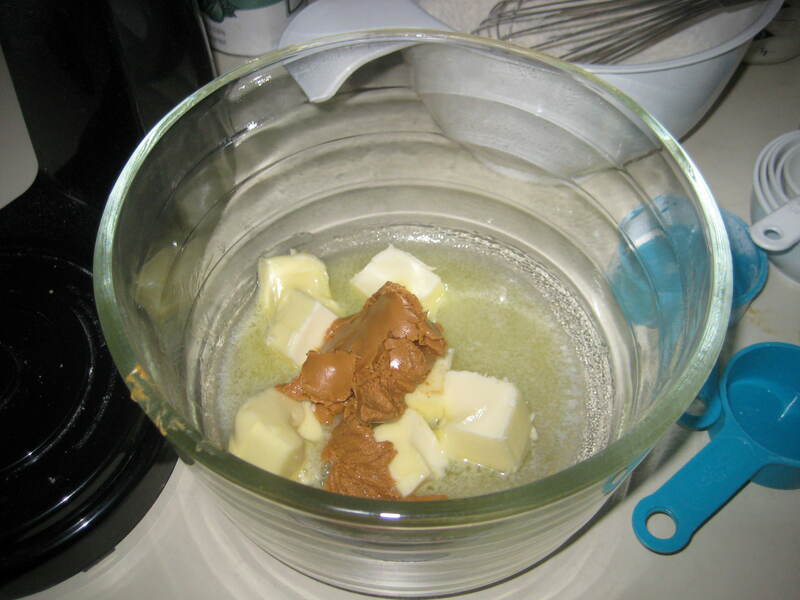 Once the mixture came to a boil, I turned it down to simmer and started on the cake batter. 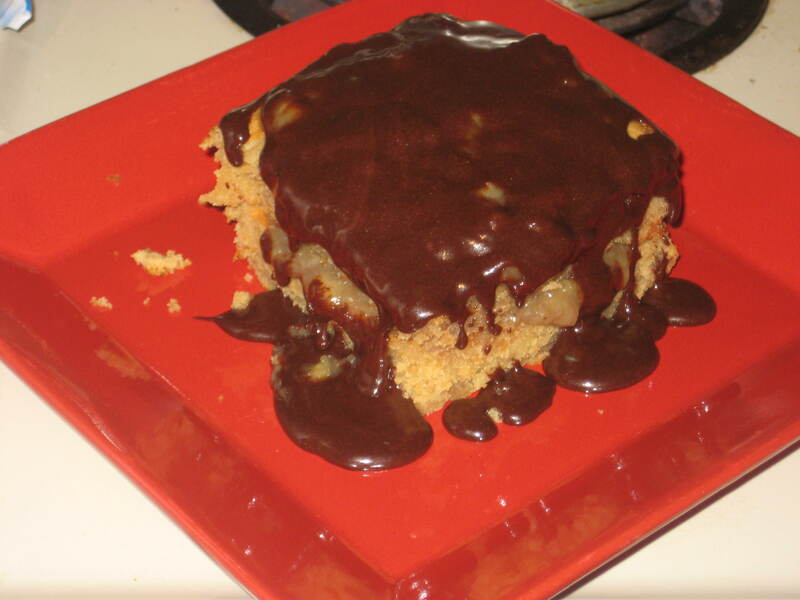 The cake is a peanut butter cake to be built in layers with the banana jam/filling between each layer. I mixed the flours, using my trick to make my own cake flour since I didn’t have any. While I was working on the cake batter, I stirred the banana mixture and smushed the larger chunks of banana with my spatula every few minutes. Once the flour was mixed well with the baking soda and salt, I stuck the butter and peanut butter in the microwave to soften. While that was in the microwave, I made my own buttermilk by adding 1 tbsp. of vinegar to 1/2 cup whole milk and let it sit to thicken. 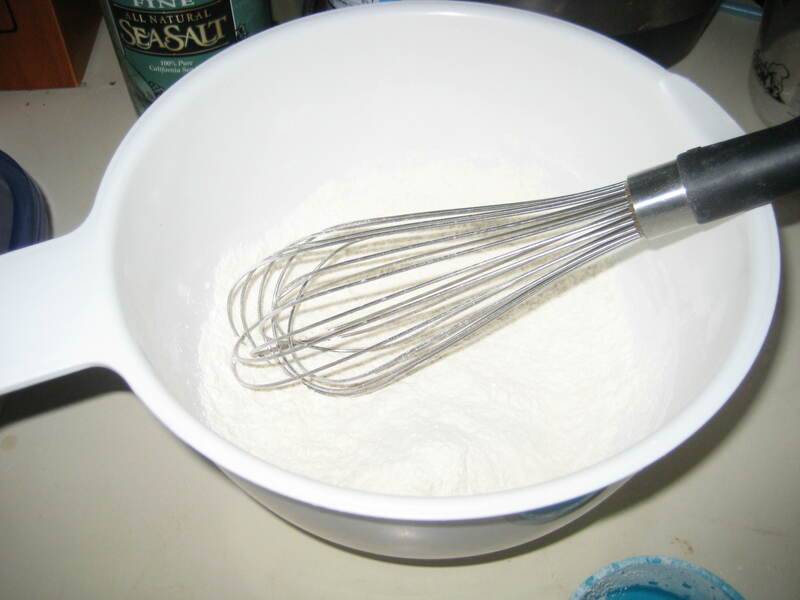 I added the sugar and creamed the mixture together using my electric mixer. Next, I added the egg and vanilla, then added the hot water to the “buttermilk” I made and began mixing the dry and wet ingredients well, alternating and finishing with the dry. Next I spread the batter into a greased square baking glass baking pan and baked it at 350 degrees for 30 minutes. 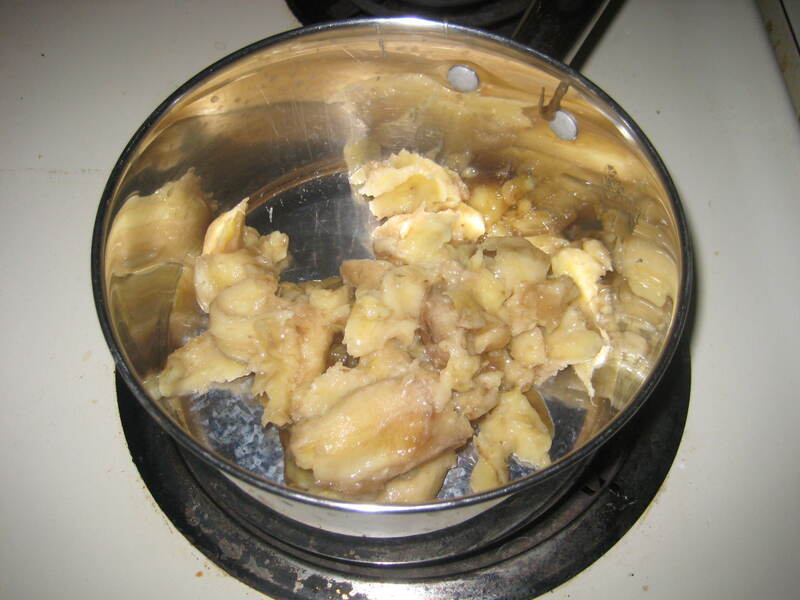 Once that was in the oven, I checked the thickness of the banana jam and pulled it off the stove, letting it cool for a few minutes before putting it into a container and sticking it in the fridge to chill and thicken. When the cake came out, I checked it for doneness (it stayed really moist but was totally done) and let it cool for a bit. I slid a knife around the edges, then put a paper towel over my hand and flipped it out onto my hand, then set it down on a flat baking sheet. I cut the cake into four equal-sized square pieces, then assembled the cakes (more like mini cakes) by placing one square piece on the bottom, covering it with a good amount of the chilled banana jam, then another cake piece on top. 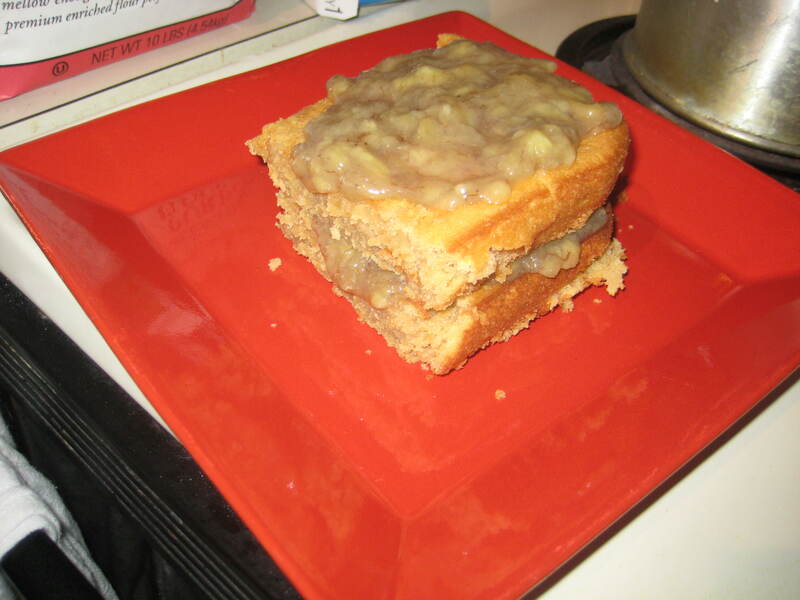 I topped it with some more of the banana jam, then let it sit and did the other mini cake. I had some chocolate frosting in the fridge that was leftover from another dessert, so rather than make the white frosting the recipe called for (and because I’m a chocoholic), I stuck the frosting in the microwave until it was thin and smooth, then dumped it over the top of each cake, spreading it and allowing it to drizzle down the sides. And then I ate it! Well, not all of it. 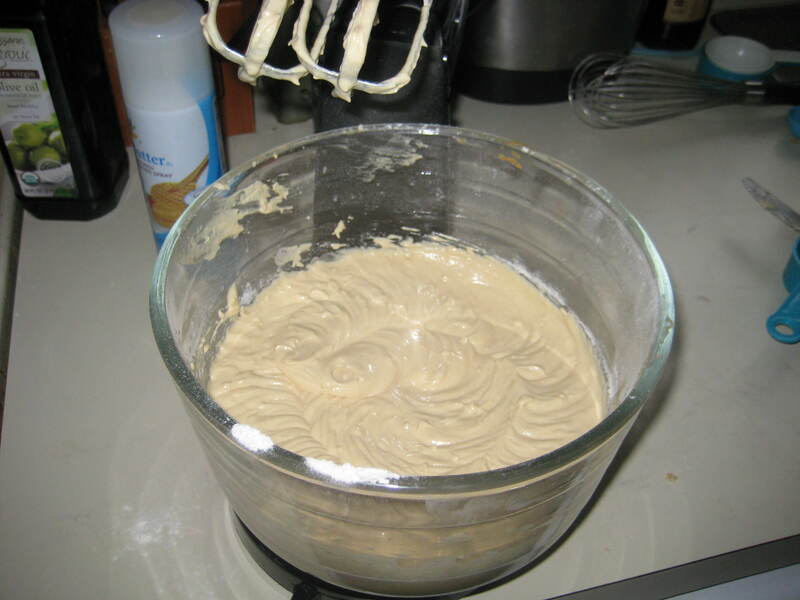 And not by myself – I had the help of my two boys, who also helped me lick the batter from the spoons and mixing bowl. And it is the bomb. My husband tells me people don’t actually say things are the bomb anymore, but I can’t help it. That’s what it is. Also, he’ll be lucky if there’s any Elvis cake left when he gets home!